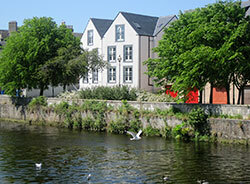 Brand new luxury self-catering apartments, with fabulous river views, in the popular Fishertown area of Nairn. Choose from either the 2 bedroom (sleeps 4) or 3 bedroom (sleeps 6) apartment, both furnished and equipped to an exceptional standard with all the comforts you’d expect from 1st class accommodation: Wi-Fi, DVD player, flat screen TV, Dishwasher, washing machine. Less than a 5 minute walk from the beautiful award winning sandy beach, Nairn Dunbar Championship golf course and the busy town centre, these properties are in an ideal location for a holiday experience to remember. Copyright © 2019 RiverbankNairn. All rights reserved.